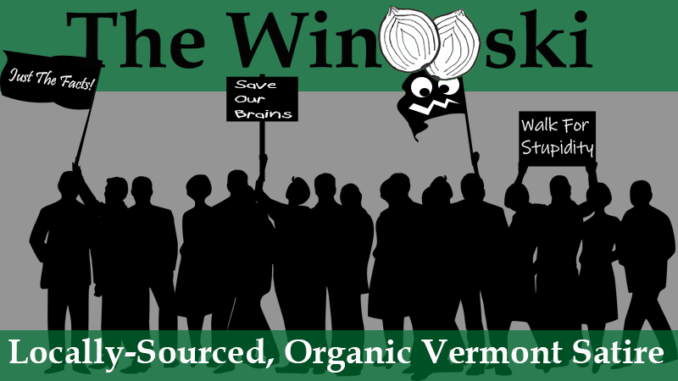 VERGENNES – Hundreds of people gathered in Vergennes this past weekend for the third annual Walk For Stupidity as participants collected pledges in an effort to wipe out idiocy in the United States. The nation has seen a sharp increase in stupidity over the past decade, with more and more people confused as to what truth is, believing obvious lies, repeating misinformation, and even going to far as to post articles clearly labeled as satire but as factual news. Despite the dramatic rise in diagnoses, there is very little funding devoted to researching stupidity and currently no know cure exists. In years past humans have believed that facts were a possible cure for stupidity, but new research shows that facts can often make stupidity take a stronger hold on the victim rather than eliminating it. The $50K raised at the walk will go towards stupidity research and efforts to develop a cure. Participants raised money by going to the root of the problem itself, creating fake fundraisers to collect donations. One walker started a GoFundMe campaign for the proposed border wall in order to collect funding, while another set up a page claiming to support the notion of a flat Earth.